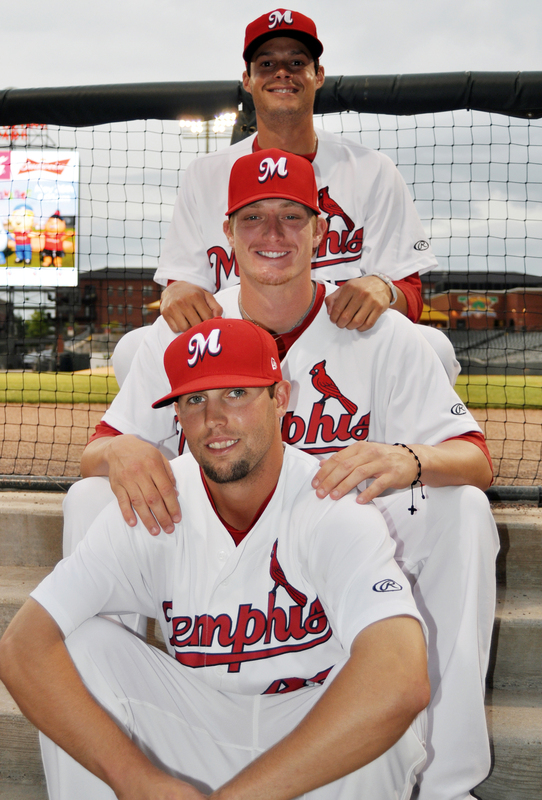 Joe Kelly (top) poses with teammates Shelby Miller (middle) and Nick Greenwood (bottom) in a Memphis uniform in 2012. St. Louis Cardinal right-hander Joe Kelly will make a rehab start this Friday at AutoZone Park against the Round Rock Express. Kelly has been out of action since landing on the disabled list back on April 17 with a left hamstring strain. He last appeared in a Redbirds uniform in 2012 when he posted a 2.86 ERA in 12 starts. Kelly is expected to throw 40-60 pitches in his rehab start. Since the last post about predictions for the Redbirds roster concerning the 2014 season, St. Louis has optioned five players to minor league camp. A majority of moves have featured more pitchers than position players. It is pitching that remains one of the strongholds in the St. Louis system though and entering the season, things are panning out well. The starting rotation in Memphis should see a few newcomers in Tim Cooney and Angel Castro, with Zach Petrick (pictured above) having an outside chance. Both Cooney and Petrick had successful 2013 campaigns, as the tandem finished as teammates at Double-A Springfield. Cooney led all St. Louis minor league players in strikeouts (148) and was tied for the top spot in wins (10). Petrick was right behind Cooney in strikeouts (122), finishing third, but bested all others in ERA (1.99). 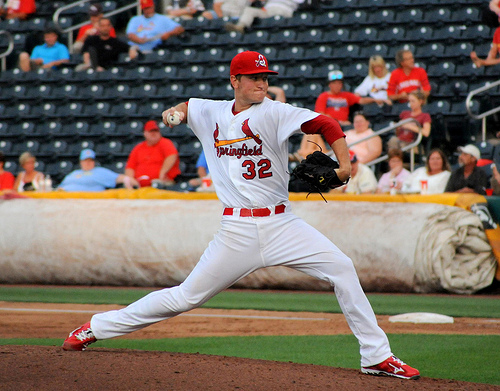 He also earned the St. Louis Cardinals Minor League Pitcher of the Year Award after the season. The pair as a whole have tremendous upside entering only their third professional seasons. If one of them is optioned to start with Double-A, then expect Boone Whiting to fill their spot. Castro was signed in the offseason after spending 2013 with Triple-A Albuquerque in the Los Angeles Dodgers’ organization. He started 19 games and recorded a 3.48 ERA in 116.1 innings of work. The Dominican Republic-native will be expected to log important innings for Memphis. Tyler Lyons (pictured above) and Scott McGregor are projected to fill the final two spots in the rotation. Lyons made his Major League debut in 2013 pitching 53 innings with a 4.75 ERA. If the big league club has any injuries in the starting personnel, Lyons will more than likely be the first to see action with St. Louis again. McGregor, the pitcher who tied Cooney with 10 wins last season, started eight games with Springfield and 17 with Memphis. While his combined ERA landed at 4.06 in 2013, McGregor will look to improve in his first full season at Triple-A. The St. Louis bullpen does have some questions, which poses uncertainty to trickle down to Memphis. Things should sort out once a few players return from injuries though. With Jaime Garcia going down at the opening of spring training and Jason Motte not appearing to be at full health, it keeps the door open for either Joe Kelly or Carlos Martinez to plug the gap in the starting rotation and the other to fill a bullpen spot. That still leaves one spot in the bullpen though which some see Keith Butler filling. Butler, who made his debut with the Cardinals in 2013, would likely remain with St. Louis until Motte can make a return. The rest of the projected relievers in Memphis are familiar to most. 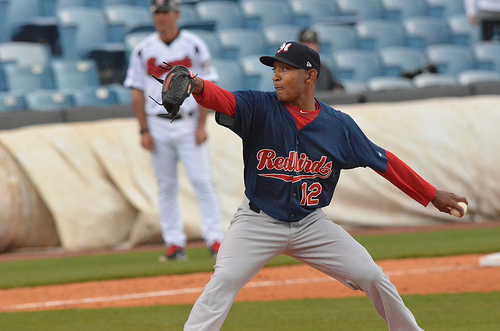 Sam Freeman (pictured above), Lee Stoppelman, Jorge Rondon, Eric Fornataro, and Nick Greenwood are foreseen as finding their way to Triple-A. Stoppelman saw three games with Memphis in 2013, his first time above the Double-A level. He showed poise last season, posting a 1.50 ERA in 55 games combined between three levels. Rondon had a good season as a Redbird in 2013 (51 G, 3.06 ERA), while Greenwood and Fornataro seek to bounce back from tough campaigns. Finally, after hurling a franchise-record 25.2 consecutive shutout innings by a reliever, Freeman found success in both Memphis and St. Louis. The lefty was 7-2 with a 2.97 ERA at Triple-A and 1-0 with a 2.19 ERA in St. Louis. If the St. Louis bullpen did not already have two lefties locked into it, Freeman would probably be on the Opening Day roster for the Cardinals, although he does still have a chance if St. Louis does not mind having three left-handers. The last spot in the Memphis ‘pen, an opening most thought Jose Almarante would fill before getting stuck in the Dominican with visa issues, seems to be a wait-and-see issue. If the Cardinals are looking internally to fill the void, it could be Heath Wyatt, simply because of the solid year he put together in 2013 between Advanced-A Palm Beach and Springfield. However, they do have a few players that could wind up on the trade block and provide them with another arm. With the moves yesterday, St. Louis is down to 34 roster players and seven non-roster invitees left in Major League camp. The key to pitching is keeping arms healthy, which is what the organization is focusing on heading into Opening Day.